This is everything you want in a chocolate sweet: a little chewy, a little crunchy and a lot of yum…bite-size for a mini treat that will bring a smile. Crush peanuts into small pieces; set aside. Cover baking sheet with waxed paper. Melt chocolate in large microwaveable bowl as directed on package, following microwave directions. Add corn flakes, cranberries and peanuts; stir gently until evenly coated with chocolate. Use large spoon to drop cereal mixture into 24 clusters on prepared baking sheet. 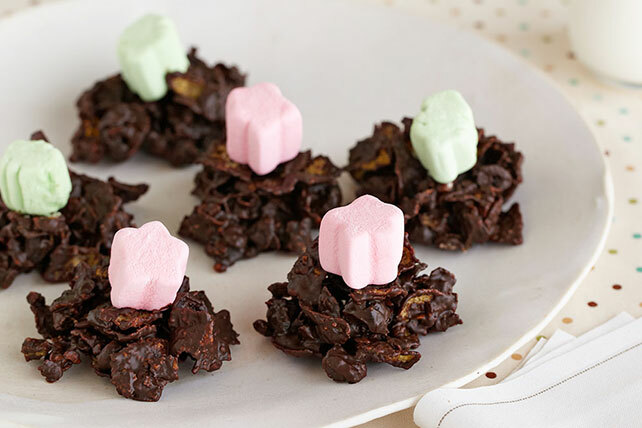 Top each with marshmallow. Refrigerate 1 hour or until firm. Prepare using 1-1/2 pkg. (4 oz each) BAKERS White Chocolate (6 oz.). Substitute JET-PUFFED Miniature Marshmallows, drained halved maraschino cherries or halved glazed candied cherries for the JET-PUFFED HOLIDAY MALLOWS Marshmallows. Store in tightly covered container at room temperature.